Find CA Inter Time Table May 2019 – CA Intermediate Exam Date Sheet, Fee, CA Inter Online Application Forms here. We’ve already provided New CA Inter Study Material & practice Manual for May 2019 & November 2019. You can also check CA Inter Study Plan for May 2019 & Nov 2019 Exam Preparation. 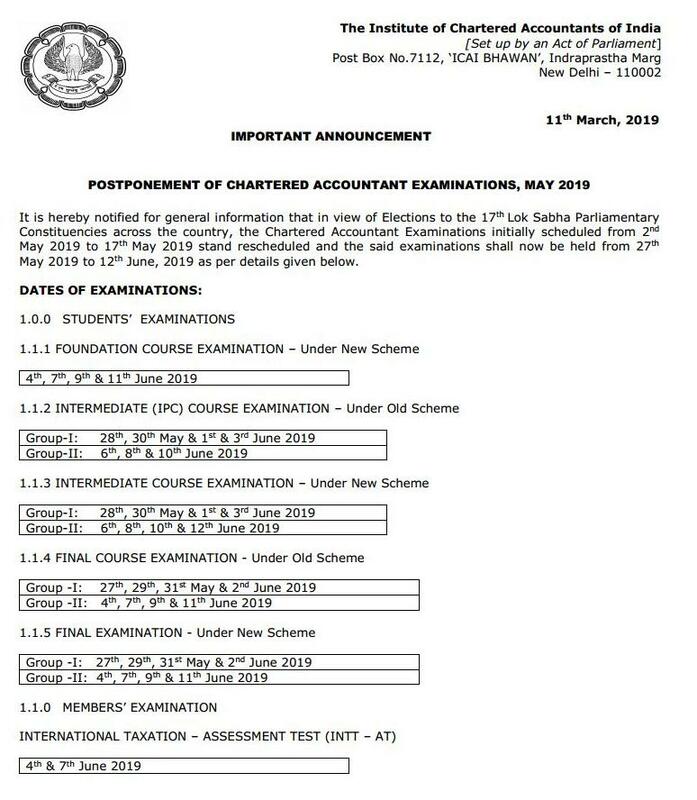 ICAI has announced the Date Sheet for CA Foundation, CA IPCC, CA Inter, Both Old & New CA Final exams for the upcoming attempt May 2019 Exams. The CA Final Exams would be beginning from 27th May 2019 and ending on 11th June 2019 and the CA IPCC Exams would be beginning from 28th May 2019 and ending on 10th June 2019. CA Intermediate (New) Exams would be beginning from 28th May 2019 and ending on 12th June 2019. May 2019 to 12th June, 2019 as per details given below. The date sheet for CA Inter May 2019 Exam applicable for all cities across India has been enclosed herewith for your ready reference. CA Final May 2019 exams are from 27th May 2019. Student Should Download CA Inter admit card May 2019 at ICAI site only. Candidates of Foundation, Intermediate (IPC), Intermediate and Final Examinations will be allowed to opt for Hindi medium for answering papers. Detailed information will be found printed in the Guidance Notes, available on the above mentioned website (http://icaiexam.icai.org). However the medium of Examination will be only English in respect of Post Qualification Course viz. : International Taxation – Assessment Test. All candidates in respect of Foundation, Intermediate (IPC), Intermediate (Revised Scheme) & Final Examinations (Existing & Revised Scheme) will be required to apply online at http://icaiexam.icai.org and also pay the applicable examination fee online only. However, the examination application form for Post Qualification Course Examinations i.e. Management Accountancy (MAC Part – I), Corporate Management (CMC Part – I), Tax Management (TMC Part – I), Insurance and Risk Management (IRM) Technical Examination, International Trade Laws and World Trade Organisation (ITL & WTO) Part I and International Taxation – Assessment Test (INTT – 5 AT) is to be filled up in the paper based form only and is priced at ` 100/- per examination application form. Share this article CA Inter Time Table May 2019 – Exam Date, Online Application, Fee Details to CA Intermediate students and other candidates who are searching for CA Inter & IPCC Exam dates and Timings. Can a B.A (ECONOMICS) student be CA after completed B.A and TALLY? Can a B.A student do CA course after completing her graduation and TALLY ERP 9?